As a business owner, overwhelm practically comes with the job description. When we talk to a new client and discuss some of their issues and how we can help them, overwhelm is something that comes up 99% of the time. The age-old saying, “too much to do, too little time” holds a lot of truth in our busy world. There could be hundreds of things begging for your attention at any one moment and with a to-do list that reads more like a scroll, feeling overwhelmed is often inevitable. I’ve dealt with overwhelm too many times to count. But I also happen to be the CEO of Mi-PA, the UK’s leading PA service. Helping busy executives delegate tasks and lessen their workload to reduce overwhelm is at the heart of what we do. As a result, I know a thing or two about dealing with business overwhelm and how to trigger the action to get things done. 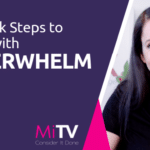 So, in this blog post (and ep.106 of Mi-TV), I share three quick steps to deal with overwhelm and increase productivity. My first tip is to transfer everything bubbling in your head onto paper. One of the reasons why you’re probably feeling so overwhelmed is because you’ve got so much going on upstairs that you can’t juggle it all. If your inner voice is babbling on and on, quieten it down by giving it an outlet. The physical act of writing your ideas and thoughts on paper is a therapeutic and almost cathartic experience. Plus, it helps you to remember important things that you don’t want to forget. And, if your memory is anything like mine, this could be a lifesaver. I don’t know about you, but my favourite type of notebook is a Moleskine (Who doesn’t love a Moleskine?). I love the soft and smooth texture of the paper and the fact I can slip it in my bag and take it out whenever I need it. When ideas pop up, they don’t stay for long. You’ve got to capture them on paper as fast as possible, or else they’ll just run away from you. You don’t have to use a notebook if you don’t want to. Use whatever tool suits you best. Make a note on your iPhone, write it up in Trello, create a word doc and use that – find what method works for you, and stick to it. Once you start writing everything down, don’t stop. Keep going until you’ve emptied every drop of information you can think to divulge. Get the gears in your mind turning and unload all your thoughts, ideas, and tasks in one place. When you’re done, you’ll feel a lot calmer, more relaxed and free from the crushing chains of overwhelm. How many times have you heard the ‘eat the frog’ saying? In other words, it’s best to tackle the big tasks first, especially in business. But I have to disagree with Mark Twain on this one. 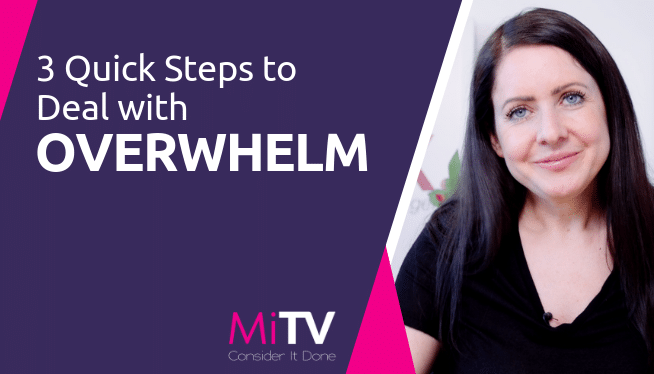 When you’re in the state of overwhelm, I don’t think it’s beneficial for anyone to tackle the most dreaded tasks first. More than likely, doing that will just make things worse. We all have things on our to-do list that we wish we could erase. Calling a problem client, replying to emails and having conversations with people that you don’t want to talk to for whatever reason are just a few examples. Facing a series of ‘frog’ tasks first will only make you feel even more stressed and anxious. To help get you over the slump, I suggest that you tackle the ‘quick wins’ first. You know, the things you enjoy doing and can do well. These are the tasks you can quickly knock off your to-do list to create momentum and give you the confidence you need to get those other, bigger jobs done. Progress is generally the number one solution to everything. When you feel like you’re making progress, you’re motivated to carry on. So, don’t be so hard on yourself. If you’re feeling overwhelmed, lift some of the weight off your shoulders and start getting your quick wins done first. Overwhelm arises when you’ve got too much on your plate. Delegating some of the tasks on your to-do list to other team members or a PA service (you know, like Mi-PA), saves time and allows you to achieve more. Think about all the things in your business that you could delegate. How about bookkeeping? Marketing campaigns? You can even delegate everyday tasks like responding to emails, taking phone calls and booking appointments with new leads, etc. Remember to value your time. When you delegate, you can expand the amount your business can deliver. While you’re working on growing the business, someone else could be working on generating new leads or dealing with customer service queries at the same time. This helps to maximise and utilise your time, which is why it’s worth spending that little bit extra to delegate. Not to mention, delegation lessens the heavy burden you’ve put on yourself and gives you the opportunity to relieve some of your stress and overwhelm. Want to free up your time so you can put more focus on creating consistent content for your business? We can help. Call me on 0161 820 6080 or email me at emma@mi-pa.co.uk. Or visit our services page to discover in more detail the diverse range of services we offer like-minded entrepreneurs and businesses right here.